Click through to see how to apply and what is required. 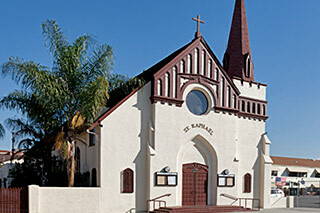 St. Raphael’s has served the Los Angeles community for over 65 years, providing a safe and happy home away from home for generations of Angelenos. Our winning sports programs are a great way for students to make new friends and find new strengths. Do you shop with Amazon? Well, now you can support us just by doing your online shopping! Check to see if your company matches! If you have friends or family that work in these companies, let them know! St. Raphael’s Parish was established in 1925. Reverend William Mullane was appointed the first Pastor of St. Raphael by Bishop John Cantwell.